We love old photo albums. Even this little album, which measures only about four inches wide by three inches high. With a front and back of thin leather, and a piece of string holding them together, the album was found by friend Verona Beguin while sorting through the basement belongings of her late mother. 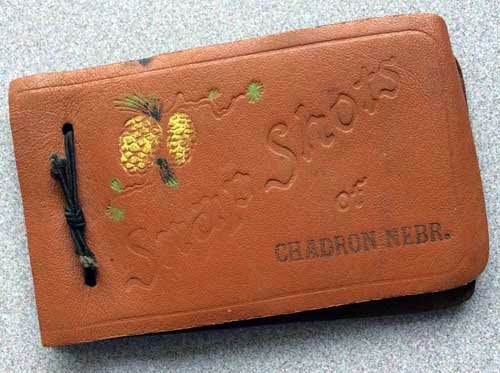 Etched onto the cover beneath a pair of pine cones are the words, "Snap Shots of Chadron, Nebr." The booklet is the kind of "tourist album" that one often found in a dime store or novelty store, but its tiny images (they're just one and one-half inches by two and one-half inches) still hearken back to an earlier era. There are no dates on the covers or on any of the photographs, but we're guessing it's probably a product of the 1920s. 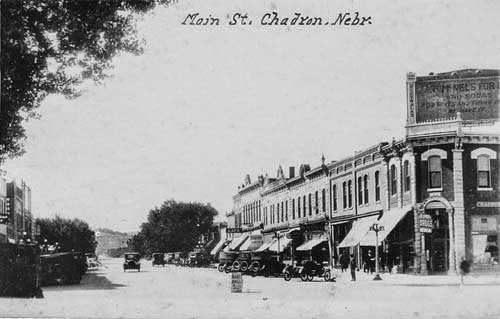 One photo prominently features the Assumption Academy building, which was built in 1923. 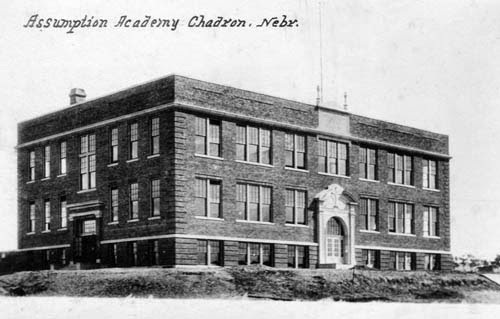 The school closed down in May of 1971. As fate would have it, we had been searching far and wide for an old photo of the Academy to accompany a Con Marshall story about Assumption Academy athletics. We had to settle for a photo from the 1960s. Now, fortunately, it can be replaced with this earlier photo. There were just nine photos in the album — but a few of them were images we'd not seen before. We found them fascinating, and you might, too. We've scanned all of the photos in this album, cleaned and brightened them up just a bit, and re-sized them considerably. Fortunately, even though the photos are small, they were pretty sharp. We've posted them in our Dawes County Journal Gallery. 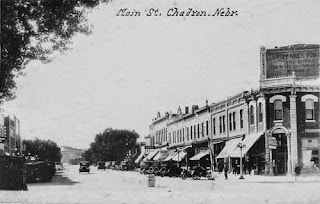 Our thanks to Verona and Perry Beguin for sharing this neat album of historic photographs!.